Parcel Service employees and Travis County residents have been terrified for the past three weeks because there have been parcels blowing up since March 2, 2018. Device blew up in front of his home on his front porch in Austin, Tx. It was initially investigated as a suspicious death however it was later ruled as a homicide. Explosion 2: March 12, 2018 killed Draylen Mason (17 years old) and injured his mother. 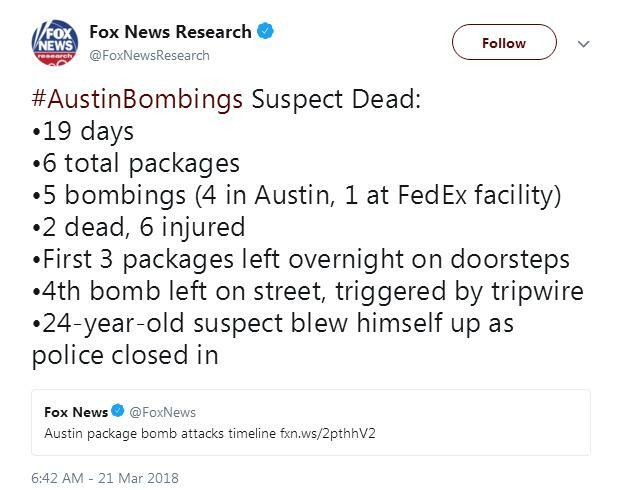 The package had been brought inside the home and the police only had a couple of hours after this bombing before they reported a third bombing. Explosion 3: March 12, 2018 no deaths were reported but at least one elderly lady was injured. Explosion 4: March 18, 2018 around 8:30 PM Two men in their 20's suffered non-life threatening injuries in the blast. This explosion was suspected to have been triggered by a trip wire and one of the men ended up with nails in his leg. "If this explosion was the result of a bomb using trip wire technology, that is showing a different level of skill above that we were already concerned that this suspect or suspects may possess," Austin Police Chief Brian Manley told ABC's "Good Morning America" on March 19. Explosion 5: March 20, 2018 at a FedEx ground distribution facility in Schertz, Texas, injuring one person. Schertz Police Lt. Manny Casas told Fox San Antonio a medium-sized package, which was heading to Austin, was on the conveyor belt when it exploded. A female employee was treated for a “possible sound injury” and was released. Final Explosion: On March 21 in the early AM, police apprehended the suspect and the 24-year-old male Mark Anthony Conditt, blew himself up as SWAT team closed into suspected serial bomber. However it has been advised by the FBI that it is very possible that packages are still out there and have asked that the public report any suspicious packages. For our community, watching this video by Travis County Services for the Deaf and Hard of Hearing to see what to watch out for!